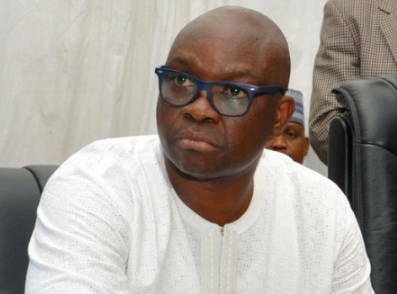 Ayodele Fayose, governor of Ekiti state, says he will no longer contest the 2019 presidential election because the All Progressives Congress (APC) rigged the last governorship election in the state. Fayose had declared an interest in the number one position in the country, vowing to defeat President Muhammadu Buhari in a free and fair election. “I am inviting you today, distinguished leaders of our party, is to inform you formally that I will be seeking the ticket of our great party, the Peoples Democratic Party (PDP), to contest the 2019 presidential election,” he had said on September 28, 2017. But speaking with TheCable, Fayose said he has decided to put his ambition aside and face the petition filed by Kolapo Olusola, his deputy and gubernatorial candidate of the PDP, in the last governorship election. The governor spoke through Idowu Adelusi, his chief press secretary. “Governor Ayodele Fayose has decided to bury his ambition because of the last Ekiti governorship election that was rigged by the APC and we have already filed a petition at the tribunal,” he said. “So presently, the governor is more concerned in getting back the mandate of his deputy, Professor Eleka, than his presidential bid. The governor also said he has no preferred presidential aspirant among those jostling for the PDP ticket. “Though the governor as a human being, a leader and party member, is entitled to have his own choice, for now, he has remained neutral,” he said.